Beautiful and Rustic Strawberry Slab Pie has a sweet crunchy, buttery crust that’s filled with a delicious thick strawberry filling. One ingredient that says “Hello I’m Spring and I am here to stay”, is strawberries! John and I have already gone through about 14 pounds of them, and not one has gone to waste. 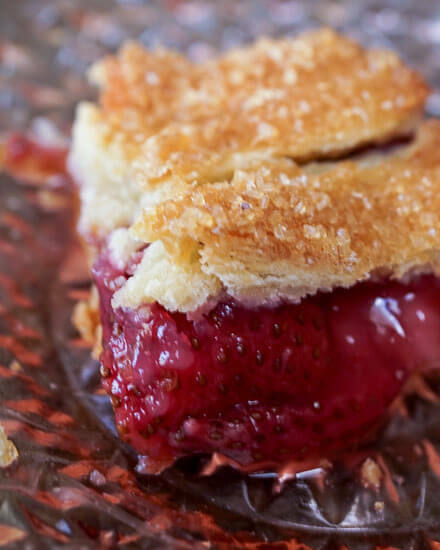 What I love about these berries is that they are perfect all the way through summer and they are perfect in a Strawberry Slab Pie! I slice them up just to snack on or serve as a side with a meal, and I have already made my yumilicious Strawberry Spinach salad. I love looking at food magazines and often tear out pages of recipes that I want to try. Don’t we all? I have this beautiful page from the magazine Food and Wine of this amazing, beautifully rustic picture of a Strawberry Slab pie. It reminded me so much of the pies that I grew up eating. I knew that I just had to make this pie and see if it was everything that I remembered. Drumroll please, it was and more. I didn’t make one little change to this recipe (and that’s a first). You don’t even need to have mad pastry skills to make this. I think it tastes better if it looks like it came from your kitchen and not that of a professional bakery. I know it tastes better. A great hubby testament came when he said he doesn’t usually like strawberry pie because they taste fake. I know what he’s talking about. Sometimes there are so many thickening ingredients used that the texture and flavor just aren’t natural. He said this one was delicious, and I agreed! 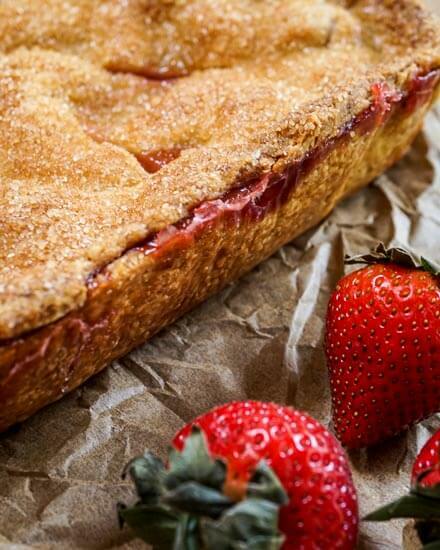 Beautiful and rustic Strawberry Slab Pie has a sweet crunchy, buttery crust that's filled with a delicious thick strawberry filling. In the bowl of a stand mixer fitted with the paddle, combine the flour, sugar, and salt. Mix at low speed. Add the chilled butter and mix at medium speed until almost incorporated. Don't over mix. You are looking for pecan size pieces remaining, about 1 minute. In a small bowl, whisk the egg yolks and the milk together. With the mixer on, slowly drizzle the egg mixture into the flour mixture until the pastry just starts to come together, about 30 seconds. It will be crumbly with about pea size crumbles. Scrape the pastry onto a lightly floured surface and gather it together. Knead with the heel of your hand, smearing the pastry against the work surface to work in the butter. You will still see the butter, and only want to work it until it comes together. These pieces of butter are what makes a crust flaky. Form the pastry into a disk. Cover the dough with plastic wrap and refrigerate for at least 1 hour. Preheat the oven to 350 degrees F. Grease an 8-inch square pan and line with parchment paper, leaving 3 inches of overhang on all sides. I actually cut two pieces of parchment paper to line my pan. One is laid in one direction and the other one goes the opposite direction. They slightly overlap on the corners. Cut one-third of the pastry off of the disk. On a lightly floured surface, roll out the small piece of pastry into an 8-inch square. Transfer to a parchment paper-lined baking sheet. Cover with plastic wrap and return to the refrigerator. Roll out the larger piece of pastry to a 12-inch square, about 1/4 inch thick. Ease the pastry into the prepared pan, pressing it into the corners and up the sides. Trim any excess pastry, leaving no overhang. Line the pastry with parchment paper and fill with pie weights. Bake for about 30 minutes or until pale golden and set. Remove the pie weights and parchment paper. Allow crust to cool completely on a cooling rack. In a medium bowl, gently mix the strawberries with the granulated sugar, cornstarch, orange zest, and salt. Spread the filling in the pastry crust. Cover with the chilled piece of pastry crust, gently pressing it down around the edges. Brush the top with the beaten egg and sprinkle with the turbinado sugar. Using a sharp knife, cut six slits, two inches long, into the top pastry. Bake for about 50 minutes until the crust is deep golden. Allow pie to cool completely for at least 3 hours on a cooling rack. Carefully lift the pie out of the pan and remove the parchment paper. Transfer to a serving dish. Cover and refrigerate leftovers. Adapted from Food and Wine, May 2015. Prep time doesn't include chilling or cooling times. 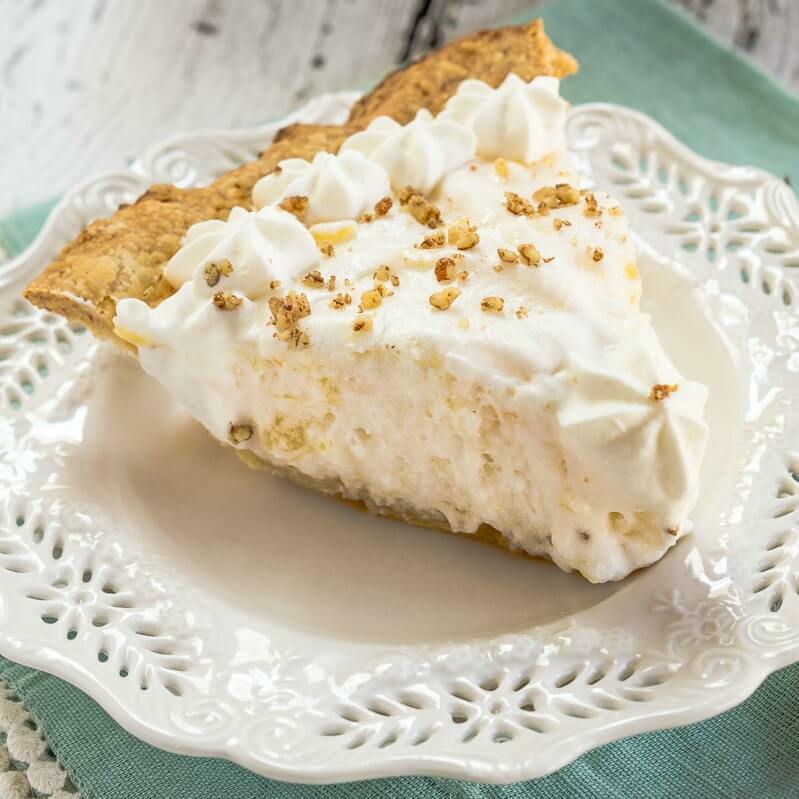 Still looking for an amazing pie for summer entertaining? Here are a couple of my favorites! This article was minimally updated on July 1, 2016. This looks amazing! Strawberries as so wonderful and it is the perfect season for them. 🙂 I love the thought of strawberries in pie too! Thanks for sharing your summer goodness. Thank you Kloe! I appreciate you stopping by. The strawberries have been just wonderful this year haven’t they? Oh man. How did I miss this? Looks phenomenal! Thank you Tux! We have just been crazy over strawberries this season. They have been amazing. I never heard of slab pies either. 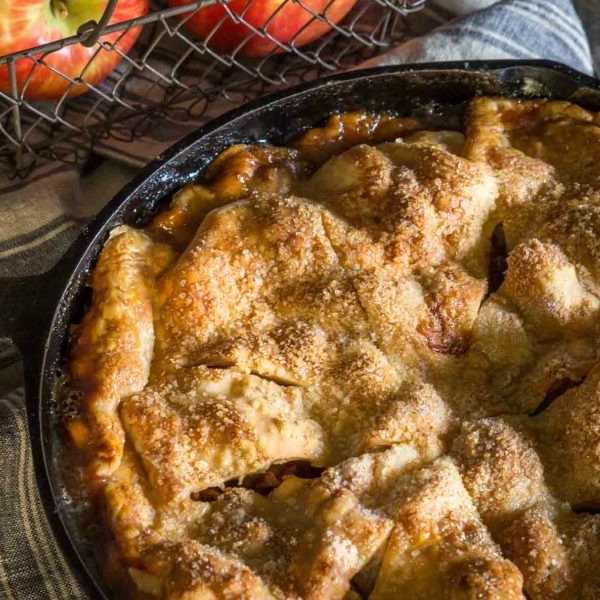 Is the slab term used due to the type of pan you bake the pie in? Otherwise, it seems like it’s a double crust pie. Juliet, it is simply a pie in a square pan. I’m not sure why it had to have a different name. Thank you for visiting! Wow, would you look at this creation of beauty? Just lovely Julie, was the pastry hard to get together? What a wonderful, summery looking dessert, I could probably eat the entire half in one sitting. Checking out your new space and all the bells and whistles, it looks great! 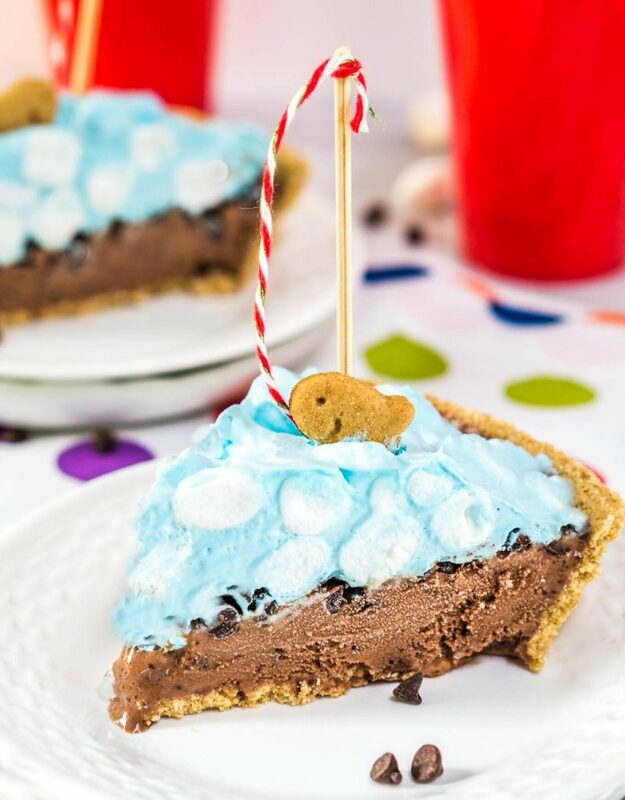 Oh wow this pie looks incredible Julie…. Thank you Chitra! We really enjoyed it! OOhhhhh man! You’re so right, nothing says spring like some strawberries, I love seeing different recipe variations, and who wouldn’t want a slab of slab pie?! 😉 Beautiful! Oh wow! Can’t believe I missed this! Looks incredible. And you are right about that artificial taste in bakeries. Can’t wait to try it. Thank you Dave! Very happy you stopped by! LOVE a slab pie- looks incredible!!! Thank you! I don’t think I would ever get tired of strawberries! Oh wow, this has my name written all over it! Absolutely divine. This is fabulous Julie. Your new space looks so good! Thank you Natalie! It was delicious! 14 pounds of strawberries??? That’s amazing! I’m sure the must be amazing enclosed in a “treasure chest” of sablé dough! This is beautiful Julie! 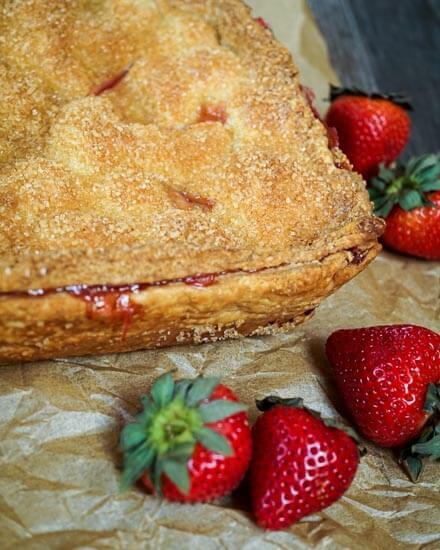 I love strawberry pie and want to make it this summer too! the crust is absolutely beautiful! I’ve been searching for a pie crust as beautiful as this too! 🙂 Pinning this! Thank you so much Dini! It wasn’t hard to make and I hope you like it! What a wonderful pie. Great pictures! Thank you so much Linda! I don’t always make my own crust (gasp), but this one was yummy! Looks delicious! Are there are leftovers?!? Thank you! They are dust in the wind. I am not familiar with slab pie. I guess I have been missing out. I love pie crust, and am always intimidated about making it. Yours looks perfect. What a yummy filling, too. Thanks for another great recipe, Julie! I really like the changes you made to your blog, as well. It looks so nice! Thanks Shari! I often take the cheaters way out and buy (gasp) rolled crust and I think it’s pretty good too. This pie was yummy. Thanks Jess! I do have an active critic, but I think he is biased! This looks so delicious! My mouth is watering for fresh strawberries. We have awhile to wait here, but I would like to try this recipe in about a month! Thank you Jenny! There are so many wonderful dishes out there that I want to try. Maybe in a year! This looks absolutely lovely Julie! The crust looks so flakey. Delicious way to welcome flavors of spring! Thank you Johanne! It was just good ole fashioned delicious! This looks and sounds delicious! I can understand your husband’s comments, I tend to be wary of bought strawberry pies as I never think they live up to expectations (strawberry tarts, on the other hand…) but this looks so tasty, I might have to give it a go. Thanks for sharing with Fiesta Friday. Thank you for cohosting! I agree, even boughten pies others like I don’t. Homemade all the way! Oh I always whine because I don’t get tropical fruit. Now I will be quiet because we have wonderful strawberries. They are great most of our summer months! I’m in the middle of the country and our cold weather wont let us grow pineapple/bananas/guava….but we do truck it in from the warmer states. I would love to go outside and pick a mango or avocado! Aha – so you are whining because you cannot GROW them NOT because you cannot get them..!!! Oh my dear – :)! This sounds and looks a-ma-zing! I’m going to try it for sure. Thank you Ana! I’ve been having a time setting it up and haven’t been getting any comments! I am very pleased that it must now be working! This pie looks incredibly yummy.. Thank you skd! It is pretty yummy :).